Home » Events » Christmas Giveaway and Newsletter! Time goes so fast doesn’t it?! I can’t believe we are almost at the end of 2012 already, in some ways it feels like its been just the blink of an eye, but in other ways, thinking back on the things I have done and achieved, its been an incredibly full, exciting, and interesting year! Some highlights for me have been, my One Wheel Indiegogo campaign and all the associated yarns spun to fund my Majacraft Aura, including a feature on the Majacraft blog and the amazing design Andy Poad so skillfully etched on the wheel for me, its truly the One Wheel 🙂 Another highlight of course was the weekend when I received my wheel, unboxing and assembling it during the JazzTurtle workshop at the home of the lovely Alet. That was a magic couple of days, meeting Esther Rodgers, sharing the learning experience with some amazing women, and enjoying the lovely environment so generously provided by Alet. The next highlight for me was taking part in the Leather and Lace secret stash challenge, dreamed up and hosted by the lovely Arlene of Spin Artiste, and Deb Lambert of Picasso’s Moon. This was a huge honour for me, it was set up by invitation, and I was so excited to see my name and yarn among those of my fiber heros such as Lexi Boeger, and Ashley Martineau, in total about 20 spinners whose work I utterly admire. This travelling yarn show is now progressing along the East coast of the US and will reach its final destination in April at the SWAY Guild Art Yarn Festival, where the yarns will be auctioned, with proceeds donated to the Farm Animal Sanctuary. Another Spin Artiste highlight for me has been the opportunity to make some guest posts for Arlene, interviewing some very talented fiberistas on this side of the planet, what an honour and a pleasure! 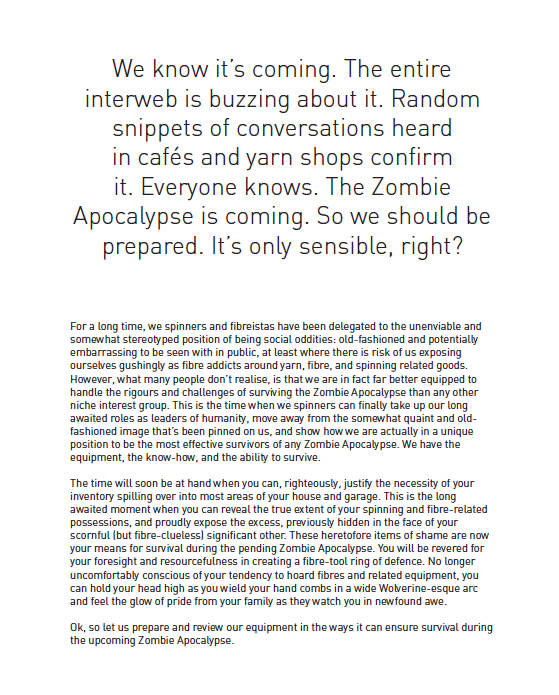 Other writing this year included the ‘Spinners Guide to Surviving the Zombie Apocolypse’ for the Entangled Magazine, as well as a feature of one of my yarns in the ‘Fiber Lust’ section of the same edition! I also have an article coming in the next edition of the Dutch magazine the ‘Spin en Verfkrant’ – soon to be known as ‘Vezels’ (Fibers). I am looking forward to that and will let you know when its out. So this brings me to the Giveaway part of this post! 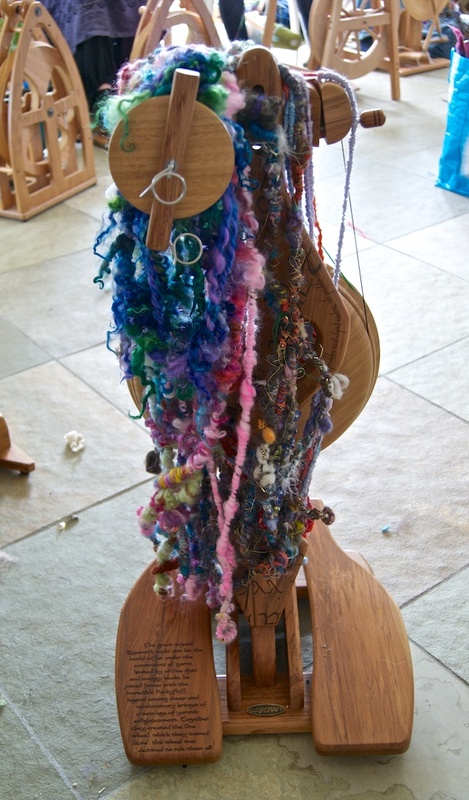 2012 saw not only the acquisition of a new Wheel (my preciousss) but also a new loom – my beautiful Saori loom. Since the arrival of this new member of the household, I have been starting to hoard all my favourite yarns, to covet warping yarns and silks, and to start picturing my handspuns in woven form rather than knitted. I love the way the yarns can sing in the weft, the texture and colour is all there, released across the width of the weave. To celebrate the end of the year with you, I would like to give someone the very first weaving I made with my art yarns, I call it ‘Landscape’, and the fibers share a journey over a natural scape of textures and colours. Its big enough to be a lovely warm wrap around your shoulders, or you could use it as a wall hanging or even a table runner. It has some gorgeous Gotland locks that I had tailspun, in fact all the fibers in the weft are handspun and hand dyed, and the warp is a great quality black merino from Saori. This is a really special piece to me, and I hope you like it too! Theres only one thing you need to do – share this on your FB page and leave a comment right here, tell me what YOUR creative goals are for 2013! The draw will be made on Dec 23 and will be a random selection from the comments on this post. Thank you for reading, I would like to wish you ALL a very Merry Christmas, and a wonderful, creative, spinaliscious New Year! I plan on spinning a vapriety of art yarns and using them in my projects. I am going to try not to any yarn. I did say try! My goal for 2013 is to improve my spinning wheel techniques. I would also like to create an etsy page and link it to my Facebook page! I’ve been meaning to make an etsy page for theast couple years but haven’t! Blessings, Merry Christmas and Happy 2013!!! It has been a wonderful year! One of my delights has been working with you, my dear friend…I have so many things percolating in my mind for 2013 — some already in motion and some ideas rattling around in my head — Of course, probably the biggest will be seeing the completion of my studio and then stuffing it with all my stuff and then having fiber events there! My goal this coming year is to concentrate a bit more on my household, and become more of an artist. I have been feeling a bit constrained in the art freedom department. I will be changing my doll design to incorporate yarns more efficiently to allow that. January will be a lot of work to make that happen, but it will be well worth it! Well as the minutes count down to the very last minute, I have arrived to share my delight in your spirit, your blogs, your new commentaries on Dutch fiber artists, your never ending creativity. Not only do you spin a good yarn, but you spin an entertaining story as well. Your yarns are soft and vibrant, and my wish for the new year is to create something delectable with those I’ve collected. FELT!! Needles – check. Sander – check. Fiber – check. 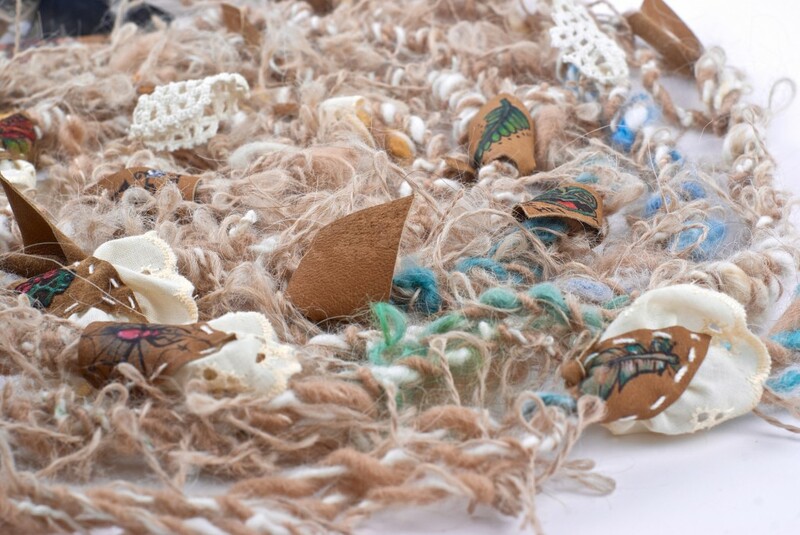 Cool things to transform into Fiber Art – check. Motivation and confidence are what I need to embark on what is sure to be a new addictive experience. Make lots and lots of things for my newest baby grand daughter due in February. Finish at least half of the WIP’s in there, and break down and frog those that no longer interest me. Wow! Susie, this Giveaway is a truly humble Gesture, your 1st piece holds many insights into you and your creative style when learning, it is always the most vulnerable and revealing of pieces. I am certain the new owner will cherish it and feel a connection to you through your virgin Saori cloth. Very Special indeed. 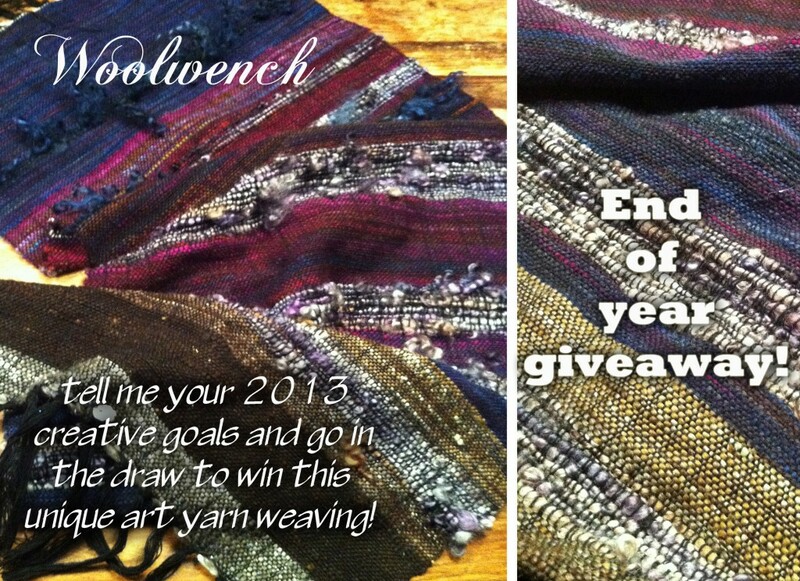 My hopes for 2013 are to collaborate with fellow fibre artists and to enjoy spinning post-apocalyptic yarns! I want to create wonderful art yarns and become proficient at knitting. I also what to write something that I am proud of. My 2013 goals are to master my spinning wheel and get my etsy shop off and running. So lots of fiber fun in my future. My creative goal is to take the time to create more so I have that outlet. With a 17 mth old it can be hard to balance being a sahm with creating! What a year you have had! Inspirational! My 2013 goals…..hmmmmm……create, create, create. Create something everyday. Congratulations on such a fabulous year! My main goal for 2013 is to have the confidence to open an Etsy shop and to sell some of my creations before they completely take over my house.